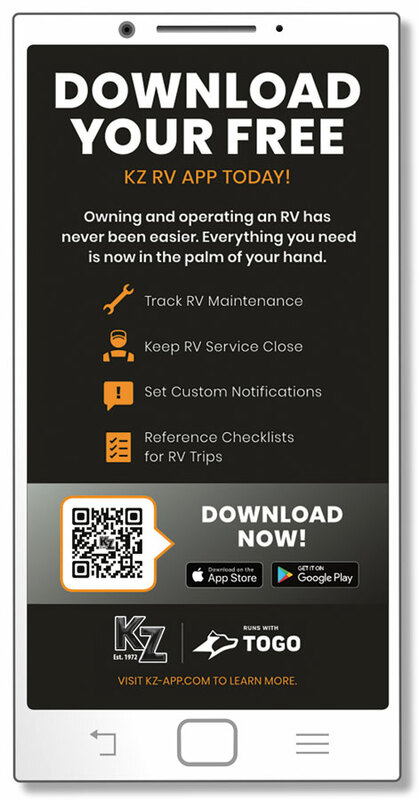 The free KZ RV app lets you log more miles with less trials! Go ahead and live the dream... the KZ RV app simplifies your journey, delivering what you had in mind when you bought your RV—your time to enjoy. Spend less time managing routine tasks and more time enjoying the great outdoors with the people (and pets!) who matter most. Custom made for all KZ and Venture owners (even if your unit isn’t new), the app keeps just about everything on your smart phone … which means the search for sticky notes and tattered folders is over!